This headquarters building for the regional government of the Department of the Bouches du Rhone was won by Will Alsop in a two-stage competition in 1990. The starting point of the project was the political decision to relocate the Departmental headquarters from the centre of Marseilles to the suburb of St Just as part of a regeneration initiative. This was made possible because the Metro provides a convenient connection to the site from all parts of the city - the trains run literally below the building. The site, close to the shore of the Mediterranean, was subject to extreme conditions of wind, including the mistral, and Alsop’s environmental strategy was an important aspect of the practice’s submission. 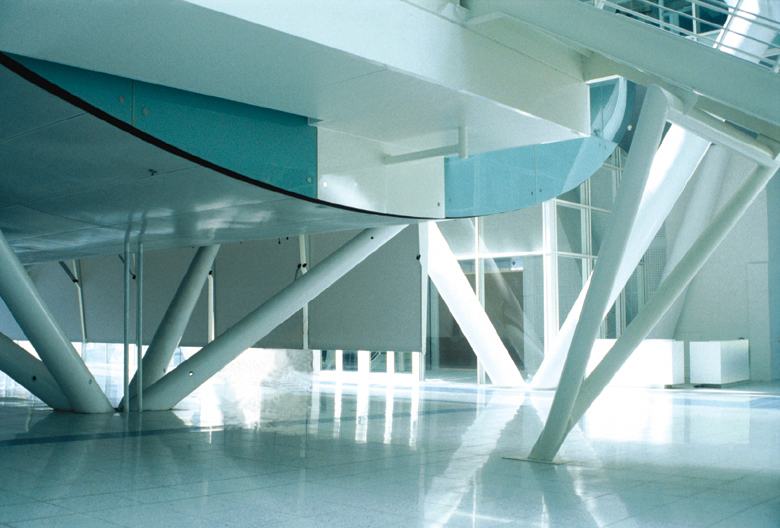 The scheme (built in 26 months between the end of 1991 and spring, 1994) brings to fruition a number of themes and ideas explored in previous Alsop projects. The basic format of the building consists of two parallel administrative blocks, rectangular in form, joined by a toplit atrium. The attached block containing council chamber and assembly hall (the Deliberatif) is cigar-shaped and joined to the other blocks by walkways and escalators. The office atrium is a public space, grand but not intimidating, dramatised by great pairs of “X” columns, with shops and cafes for staff and visitors. The tremendous presence and impact of this major late 20th century public building is achieved with a high degree of economy - the materials used, concrete, solaglass, timber and steel, are straightforward but used in an extraordinary way. There was an equal stress on economy in the services strategy, with only limited use of air conditioning and optimum use of natural ventilation. Shading devices, including a sweeping fabric awning across the assembly hall block, counteract the effects of the Mediterranean sun. The impact of the building as a public landmark is vastly enhanced by the use of strong colour in the external elevations - stimulating, comfortable and affordable; the Hotel is the antithesis of the conventional bureaucratic fortress.